Third in a multi-part series AT THE MILL. 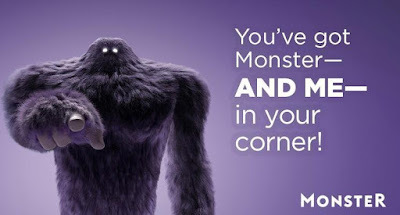 Back in the spring of 2014, Monster.com, at one time a famous technology disruptor in the jobs search industry, moved away from Maynard, giving up on its lease of 300,000 square feet at the mill and moving 625 jobs to a smaller space in Weston. 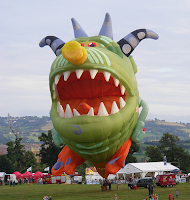 Monster had arrived for the birth of Clock Tower Place in 1998. Its growth, shrinkage and finally, abandonment contributed mightily to the arc of Clock Tower, which came to an inglorious end a year later. 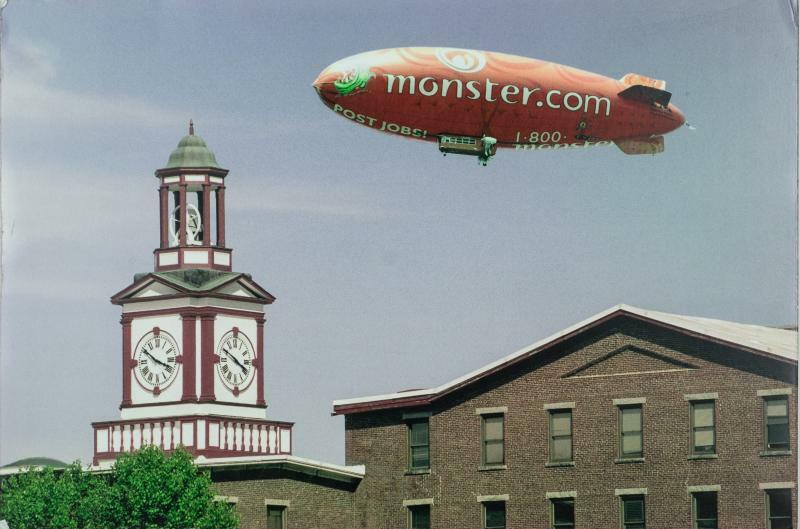 For such a large company, Monster was a lightly visible presence in town, sponsoring blood drives and an annual road race to benefit the Boys and Girls Club. At its peak a thousand employees showed up every day, but the company did not work as hard as it might have to be an actively participating citizen. 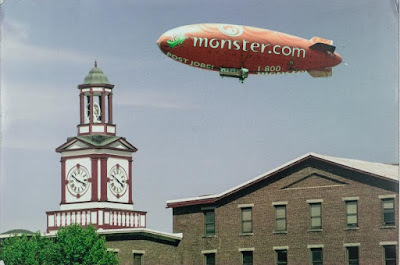 For Monster, the arc of the company's presence in Maynard roughly paralleled the company's course from a technology innovator to a technology can-it-catch-up-again. When men stand on a corner near a Home Depot, and other men drive up in pick-up trucks looking for day labor, that's a job exchange. Ditto a bulletin board covered with business cards next to the door of a diner. Put the jobs offered on paper and disseminate copies, and it's a newspaper's jobs section. Now suppose the match-ups are computerized. Potential employers post and search. Potential employees search and post. Inclusion and exclusion criteria filter the searches. Voila, Monster! Initially, Monster owned the niche. It was the first public job search on the Internet, first public resume database in the world, and the first to have job search and job alerts. The company went public, i.e., sold shares on a stock exchange, in December 1996. Valuation peaked in 2000 at $8.5 billion. Much was written about Monster’s decline. What went wrong? From Woody Allen, in the movie Annie Hall: "A relationship, I think, is like a shark. You know? It has to constantly move forward or it dies. And I think what we got on our hands is a dead shark." Monster was a dead shark. It was too late to social media, to apps, to niches, to better search engines. These days, CareerBuilder. Indeed, Glassdoor and LinkedIn dominate the generalist jobs market, while DICE, TheLadders, USAJobs and LookSharp service niches. In 2016, what remained of Monster was purchased for only $426 million. The company continues to downsize. This fall the monster itself was re-imaged as large, purple and hairy, with glowing eyes, but it is in no way clear that this will reverse the trend. each hand. 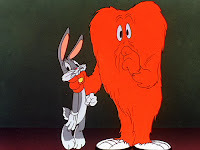 It's an American animation thing dating back to the 1920s. Much like Monster, most of the companies in the mill, and for that matter, the owners and operators of Mill and Main, are near-invisible to the inhabitants of the town. One exception is Battle Road Brew House, which has involved itself in Octoberfest, the veterans-support pub crawl and a 5K road race. The other tenants, the ones whose employees step out for meals and shopping in Maynard’s stores, are the economic engine helping this town prosper. Can they do more than just shop? Yes! from the Bugs Bunny years. Corporate volunteer programs are a means of committing to a cause or a community. Especially in a small town, a company can become a useful, visible presence that improves quality of life. And, as these days, more people are looking to live near where they work, contributing to the community benefits the company, as a vibrant community makes it easier to recruit and keep employees. Research clearly shows that a well-organized company volunteer program lowers employee turnover, more than paying for any outlay the company makes. How to make this work? Corporate leadership needs to ask employees what they believe or are already involved in as volunteer activities. From this, companies may decide to officially sponsor specific activities, or else have an action plan that acts as a clearing house for company approval of ideas that employees want to pursue. Paid time off and matching funding are useful ways to commit. Lastly, companies need to close the loop – get reports on what employees are volunteering for, and share those stories within the company. And it won’t hurt to coordinate public relations publicity with the town and the local media.